Hyland, J. B., 1961. 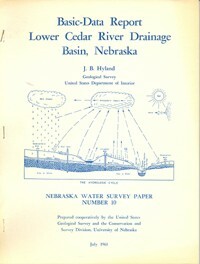 Basic-Data Report, Lower Cedar River Drainage Basin, Nebraska (WSP-10): 92 pp., size 8.5" x 11". Hyland, J. B., 1961. Basic-Data Report, Lower Cedar River Drainage Basin, Nebraska (WSP-10): 92 pp., size 8.5" x 11". Description: This report contains basic data collected in the Cedar River drainage basin and in a part of the Loup River valley below the confluence of the Cedar River as part of a program of the U. S. Department of Interior for the development of the Missouri River basin. LIMITED AVAILABILITY. UN-BOUND COPY UPON REQUEST, PLEASE ALLOW TIME FOR PRODUCTION.